Tilly’s reported third-quarter earnings fell 27.3 percent in the third quarter due to a calendar shift and landed at the low-end of guidance. Comps rose 4.3 percent, also at the lower end of guidance. Comparable store net sales, including e-commerce, increased 4.3 percent. Comparable store net sales in physical stores increased 1.3 percent and represented approximately 86 percent of total net sales. E-commerce net sales increased 26.7 percent and represented approximately 14 percent of total net sales. Comparable store net sales, including e-commerce, increased 1.5 percent in the third quarter last year. Total net sales of $146.8 million decreased by $6.0 million, or 3.9 percent, from $152.8 million last year, due to the calendar shift impact of last year’s 53rd week in the retail calendar. This retail calendar shift caused a portion of the back-to-school season to shift into the second quarter this year from the third quarter last year, reducing last year’s comparable net sales base for the third quarter by approximately $14 million. This retail calendar shift impact was partially offset by an aggregate increase of approximately $8 million in comparable store net sales and net sales from seven net new stores. Gross profit of $45.8 million decreased by $4.3 million, or 8.6 percent, from $50.1 million last year, primarily due to the calendar shift impact on net sales described above. Gross margin, or gross profit as a percentage of net sales, decreased to 31.2 percent from 32.8 percent last year due to the retail calendar shift impact on net sales. Buying, distribution and occupancy costs deleveraged 200 basis points against lower total net sales. Product margins improved 40 basis points, primarily due to lower total markdowns as a percentage of net sales. Selling, general and administrative expenses (“SG&A”) were $37.6 million, or 25.6 percent of net sales, compared to $36.0 million, or 23.5 percent of net sales, last year. As expected, SG&A deleveraged 210 basis points compared to last year primarily due to the calendar shift impact on net sales described above. The $1.6 million increase in SG&A was primarily attributable to an increase in store payroll of $0.9 million due in part to minimum wage increases, expenses of $0.7 million associated with our secondary offering completed in early September 2018, and increased online marketing costs of $0.6 million associated with e-commerce net sales growth, partially offset by a legal matter accrual of $0.7 million in the prior year. Operating income was $8.2 million, or 5.6 percent of net sales, compared to $14.1 million, or 9.2 percent of net sales, last year. The $5.9 million reduction in operating income was attributable to the retail calendar shift impact on net sales described above. Income tax expense was $2.4 million, or 26.8 percent of pre-tax income, compared to $5.7 million, or 39.6 percent of pre-tax income last year. The reduction in this year’s income tax rate was attributable to the change in corporate tax rates signed into law late last year. Net income was $6.4 million, or $0.21 per diluted share, compared to $8.8 million, or 30 cents per diluted share, last year. The $0.09 decrease in earnings per share was attributable to the combination of the retail calendar shift impact on net sales of approximately $0.11 per diluted share and costs associated with the secondary offering completed in early September 2018 of approximately $0.02 per diluted share. The remaining positive variance was primarily due to improved operating results driven by increased comparable store net sales. On a non-GAAP basis, excluding the impact of the secondary offering costs this year and the impact of the legal matter accrual last year, net income was $7.1 million, or $0.24 per diluted share, this year compared to $9.2 million, or $0.31 per diluted share, last year. When it reported second-quarter results, Tilly’s projected sales would range between $145 million to $151 million based on an assumed three to six percent increase in comparable store net sales. The company expects third quarter operating income to range from approximately $8.0 million to $9.5 million, and earnings per diluted share to range from 20 cents to 24 cents. Comparable store net sales, including e-commerce, increased 3.1 percent. Comparable store net sales in physical stores increased 2.2 percent and represented approximately 87 percent of total net sales. E-commerce net sales increased 9.2 percent and represented approximately 13 percent of total net sales. Comparable store net sales, including e-commerce, increased 1.5 percent in the first three quarters last year. Total net sales of $427.9 million increased by $15.3 million, or 3.7 percent, from $412.6 million last year, primarily due to increased comparable store net sales and net sales from seven net new stores. Gross profit of $130.9 million increased by $6.9 million, or 5.6 percent, from $123.9 million last year. Gross margin increased to 30.6 percent from 30.0 percent last year primarily due to leveraging lower total occupancy costs on higher total net sales. Product margins improved by 10 basis points due to lower markdowns as a percentage of net sales. SG&A was $108.8 million, or 25.4 percent of net sales, compared to $111.4 million, or 27.0 percent of net sales, last year. Last year’s SG&A included an estimated $6.8 million in provisions related to legal matters. This year’s SG&A includes a $1.5 million reduction to such provisions as a result of the final settlement of the related legal matter in early August 2018, and $0.7 million in expenses associated with our secondary offering completed in early September 2018. The net year-over-year impact of these legal matter provisions, partially offset by our secondary offering expenses, accounted for the improvement in SG&A as a percentage of net sales. After consideration of the legal matter impacts and secondary offering costs, primary dollar increases in SG&A were attributable to an increase in store payroll of $2.1 million primarily due to minimum wage increases and higher comparable store net sales, increased corporate bonus provisions of $1.2 million due to improved operating results, and increased online marketing costs of $1.1 million associated with e-commerce net sales growth. On a non-GAAP basis, excluding the impact of legal provisions from both years and the secondary offering costs from this year, SG&A was $109.6 million, or 25.6 percent of net sales, compared to $104.6 million, or 25.3 percent of net sales, last year. Operating income of $22.0 million, or 5.2 percent of net sales, increased by $9.5 million compared to $12.5 million, or 3.0 percent of net sales, last year. Of this $9.5 million improvement in year-over-year operating income, approximately $7.6 million was attributable to the net aggregate year-over-year impact of the legal matters and secondary offering expenses noted above, and approximately $1.9 million was attributable to increased comparable store net sales results and occupancy reductions. On a non-GAAP basis, excluding the impact of legal provisions from both years and the secondary offering costs from this year, operating income was $21.3 million, or 5.0 percent of net sales, compared to $19.4 million, or 4.7 percent of net sales, last year. Income tax expense was $6.1 million, or 26.1 percent of pre-tax income, compared to $5.4 million, or 40.1 percent of pre-tax income, last year. The reduction in this year’s income tax rate was primarily attributable to the change in corporate tax rates signed into law late last year. On a non-GAAP basis, excluding the impact of legal provisions from both years and the secondary offering costs from this year, income tax expense was $5.8 million compared to $8.0 million last year. The company expects its fourth quarter total net sales to range from approximately $163 million to $168 million based on an assumed 2 percent to 5 percent increase in comparable store net sales. Last year’s fourth quarter included an extra week as a result of the 53rd week in last year’s retail calendar, which accounted for approximately $7.1 million in added sales for such quarter versus the comparable 13-week period this year. The company expects fourth quarter operating income to range from approximately $8.5 million to $10.0 million, and earnings per diluted share to range from $0.22 to $0.26. This outlook assumes an anticipated effective tax rate of approximately 26 percent and weighted average shares of approximately 30.1 million. 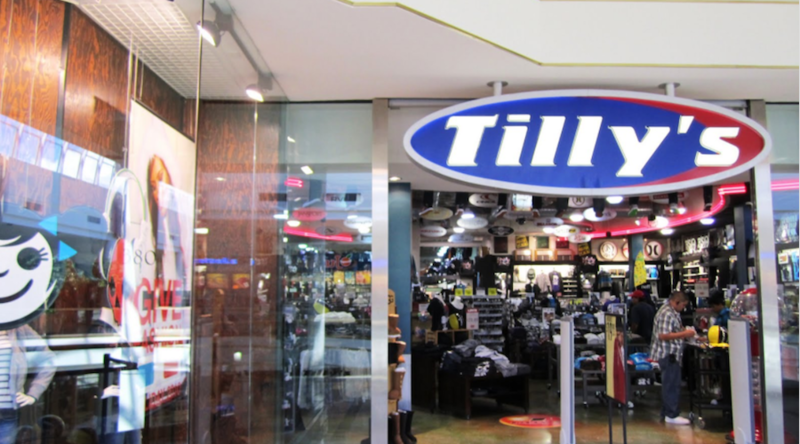 Pursuant to the settlement terms of the previously noted legal matter, the company issued non-transferable discount coupons to approximately 612,000 existing Tillys customers in early September 2018 which allows for a one-time 50 percent discount on a single, future purchase transaction of up to $1,000. Any unused coupons will expire on September 4, 2019. To date, less than 1 percent of these coupons have been redeemed, resulting in no material impact to the company’s comparable store net sales or operating results as a whole. Although redemptions have been very low in number thus far, there can be no assurance that the impact of any future coupon redemptions during the 2018 holiday season, or during fiscal 2019, will remain immaterial. Our fourth quarter outlook does not contemplate any specific impacts from future usage of these coupons. The company expects to open up to 15 to 20 new, full-size stores and an as-yet undetermined number of RSQ-branded pop-up shops during fiscal 2019, in each case assuming appropriate lease economics are obtained. The specific timing of any new store openings is not yet known. The company expects total capital expenditures for fiscal 2019 not to exceed $25 million, comprised primarily of new store costs supplemented by continuing technology investments. Finally, the company expects the impact of legislated minimum wage increases, merit increases, new systems costs, and the new lease accounting standard to result in an aggregate increase of approximately $6 million in its annualized operating costs before consideration of any comparable store net sales assumption. The company estimates that its fiscal 2019 comparable store net sales would need to increase by approximately 3 percent in order to absorb these anticipated cost increases without creating any deleverage of expenses as a percentage of net sales.